With the resurgence of vinyl over the last decade manufacturers have taken notice and there are more offerings than ever for new vinylphiles. Not only do we have a great selection of turntables from VPI, Clearaudio, Music Hall, Marantz, Pro-Ject, etc. but there are lots of great new accessories as well to enhance your vinyl listening experience. 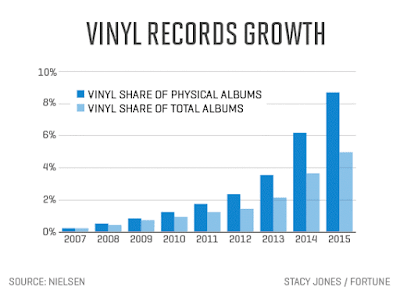 As we all know, listening to records can be a little inconvenient compared to firing up a Spotify playlist, however there are a few new items to the market that can help you out. 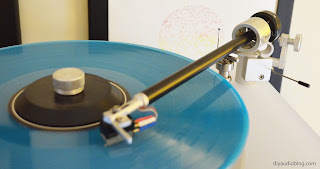 If you're like me and can't always immediately get up at the end of a record side, you can now get a device that lifts your tonearm so your stylus isn't sitting there grinding on the end loop for several minutes. If you are using a $25 cartridges, this might not be a big deal, but there are some people out there using fancy pants carts that would be very interested in these. There are a couple solutions I'm aware of: The Pahmer Enterprizes Q Up, which appears to be a great choice for value oriented listeners, and the Integrity HiFi Tru-Lift, which, in my opinion, seems a little more elegant and "at home" on a nicer turntable. The job of these devices is relatively simple, as the tonearm reaches the end of the record, it presses against a lever or switch and the tonearm is lifted to prevent the stylus from remaining on the record. 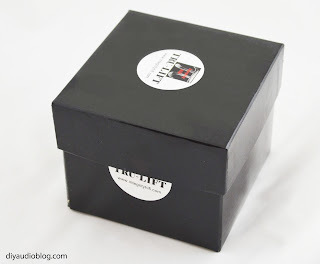 This post is going to be a brief review of the Tru-Lift. I say brief as it does exactly what its supposed to do without any notable flaw. Below is the no-frills packaging, which I actually appreciate. It drives me nuts when I purchase something I already knew I wanted and it seems like the manufacturer spent more on the package than the product itself... but I digress. The Tru Lift is available in Brass and Stainless Steel, both relatively heavy metals. For the science savvy, the density of brass is between 8440-8730 kg/m³ and the density of stainless steel is between 7480-8000 kg/m³, so the brass units of the same size will weigh slightly more. I like the look of the brass (and the added weight) but the stainless matches my setup better. I purchased the Deluxe package that included four different heights, should I ever change my turntable down the line. 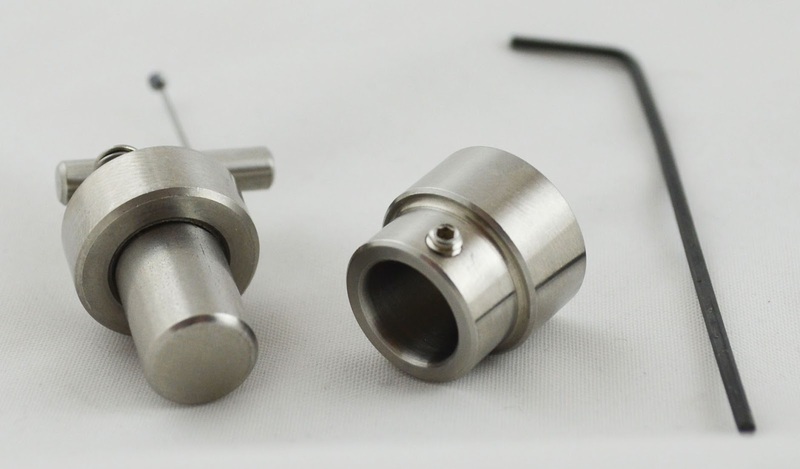 The units can be purchased individually for $199 (as of this writing) and are available/adjustable from 1 1/4" to 2 3/4", and the Deluxe package is available for $259. The units have a nice heft to them, which is good as you don't want them to fall over. Unscrewing the unit gives easy access to the internal mechanism. The height is easily adjustable via set screw. Setup took me a couple of tries, but once it's in the right spot you're good to go. I had to adjust a bit after these photos were taken, the little lever needs to be facing toward you to work as intended. There's a video that explains the setup. 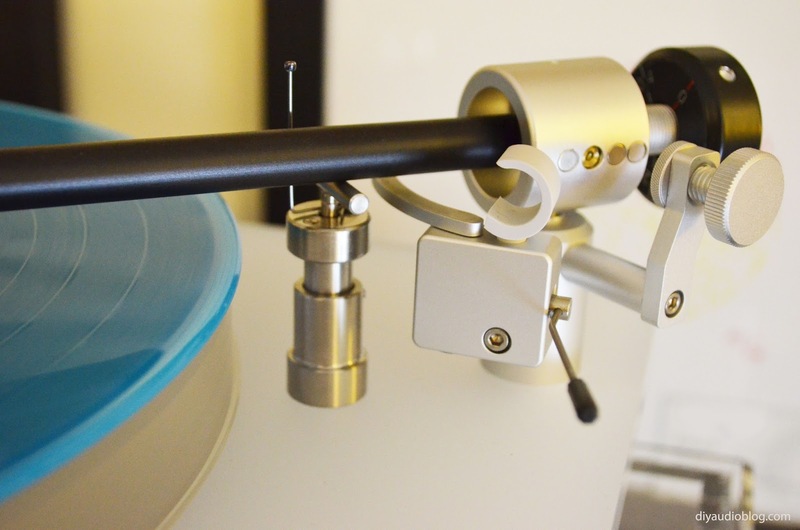 Once the lever is slowly pushed into by the tone-arm, the spring loaded piece slowly and carefully lifts up the tonearm. The unit remained stationary when the mechanism was struck, which is great as you don't have to move it back into place. To reset the mechanism, you simply push the spring loaded piece back down and you're good to go. Overall I'm fond of the Tru-lift. It's a simple, elegant solution that does exactly what it is supposed to do and is easy to use. Pricing seems on par with other audio accessories, but may be a little high for those with modest systems. I'm actually surprised there are not more products like the Tru-Lift available, but it definitely satisfies a need for avid vinyl listeners. Highly recommended. The Fine Print: Zynsonix Audio LLC and DIYAudioBlog have no affiliation with Integrity HiFi and/or the Tru Lift product. The author of this review was offered dealer pricing for the Tru Lift system as consideration upon request, however was not a factor in the evaluation of the product. I've been quite busy over the last couple of years and haven't been able to build as much as I would have liked, but now that I'm getting back into the swing of things, there are a number of DIY providers who have left the space, so I wanted to put together a list of all the great companies who still offer DIY kits, boards, transformers, etc. I hope it's of use to you, and please try to support the DIY community in any way you can. There's not much money in selling just boards, it's more of a community service in many cases. This is a growing list and I'll be adding more as time goes on. If you have one you'd like to see here, please add in the comments section. AMB Labs (Solid State board and part provider): Ti Kan has lots of great solid state options including headphone amps (desktop and portable), power amps, DACs, power supplies and more. The famous β22 (Beta 22) balanced headphone amplifier is here, as well as the portable Mini³ headphone amp which shouldn't be too hard for beginners. Tons of boards and parts available and a good forum. Antek (Transformers): My favorite provider of toroidal transformers, Antek has fantastic pricing and a large variety of values, most of which are typically in stock. You'll find tube-friendly 6.3V and 12.6V heater secondaries here as well. Audio Note Kits (Tube amplifiers, Preamplifiers, DACs, etc. ): A little higher end than the typical DIY kit, ANK has quite a few nice offerings, most of which are based around universal chassis that work with several different configurations. Also one of the very few kit providers that offer a DAC, perhaps the only tube-based one I am aware of. Prices range from $1,300 - $6,850 per kit, so these may be out of reach for the budding audiophile, but I still consider them a good value for the parts that are being provided. One thing to note is that the tubes are hidden within the chassis on some models (many of us like the tubes out in the open because they not only look nice but it's easier to roll them). AudioSector (Chip Amps): Nice simple circuit PCBs designed around Texas Instruments LM3875 and LM4780 chips. 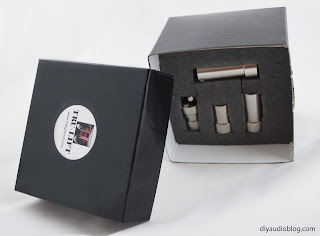 Beezar (Tube Amp Kits): Tom (Tomb on HeadFi) runs Beezar and offers great, proven designs from ECP Audio (The Torpedo I and II headphone amps) as well as other DACs and headphone amps. Tom puts together a great kit and the documentation is unbelievably good. Every step is illustrated similarly to the Bottlehead kits. Highly recommended and beginner friendly. Bottlehead (Tube and Solid State Kit Provider): Bottlehead provides mostly tube builds, from headphone amplifiers, to low-wattage speaker amplifiers, to pre-amps, etc. This is a good company for the budding DIYer as the directions are very explicit with color photographs and the support is quite good. Most of the builds are point to point with a few small circuit boards here and there for constant current upgrades usually. I'm certain they've sold a truckload of Cracks, a very affordable headphone amp offering. Below is Tyll Hertsens of InnerFidelity (great site) building a Crack. Cinemag (Transformers): Very nicely made signal conversion and moving coil step up transformers. DigiKey (General Supplier): Carries all the various passive and active components you'll need to fill a circuit board (resistors, capacitors, op-amps, sockets, etc.). If they are out of a product, try Mouser. DIYAudio Store (Solid State PCBs, Kits, Chassis): Never to be overlooked, DIYAudio.com has its own store with some great little accessory PCBs like the soft start board, a universal power supply, as well as some legendary Nelson Pass designs and big hulking chassis you'll need to house them in. Pricing is very reasonable. DynakitParts (Tube Kits, PCBs, Transformers): Kevin at Dynakit parts is an incredible guy. You can build Dynakits just like you used to back in the 1950s thanks to his incredible efforts. Dynaco, if you aren't familiar, is likely the most legendary audio kit manufacturer of all time. The ST70, their 35 watt-per-channel amplifier is a ubiquitous favorite, and their other models, including the ST35, MKIII, MKIV, and PAS pre-amp all have a very strong following. Dynakitpart's uses the original circuits, which are excellent, but perspective buyers may also use alternative boards from a variety of producers (and will need to in the case of the PAS pre-amp and SCA35 integrated). The newly designed boards have some nice attributes in some cases, but are becoming harder to obtain lately. The Quad-caps are very cool and vintage looking, but some people prefer cap boards on the inside instead. The beautiful thing is that this is DIY, and you can do whatever you like. Edcor (Transformers): Affordable custom-made "E I" transformers with iconic blue bells. Everything is made to order at Edcor and takes 6 weeks to get produced. If you need something immediately, Hammond may be a better bet. ElectraPrint (Transformers): Well-made custom "E I" and moving coil transformers at reasonable prices and excellent customer service. Check out the ebay page for ready made units. Glass Jar Audio (Solid State Kit Provider): Jeff is kind enough to assemble kits with designs from AMB, Cavelli, Toole and others. It's much easier to order through him than sourcing all the parts all over the place and the pricing is very reasonable. Glassware Audio Design (Tube PCBs and Kits): Glassware has an impressive collection of designs, mostly around the Aikido circuit. You'll find pre-amps, phono pre-amps, headphone amps, volume attenuators, and power rectifier boards. Nice really thick PCBs that are well laid out and some offer the ability to fit bypass capacitors and large coupling capacitors (for DIYers who have strong opinions ;) ). Manuals and schematics are included with purchases. Not as friendly for beginners, start with Bottlehead unless you have some experience under your belt. Hammond (Transformers and Chassis): Hammond offers a great array of transformers, inductors and chassis which are perfect for small to large DIY projects. Hammond is carried by a number of suppliers such as Angela, Digikey, Mouser, Allied, and others. 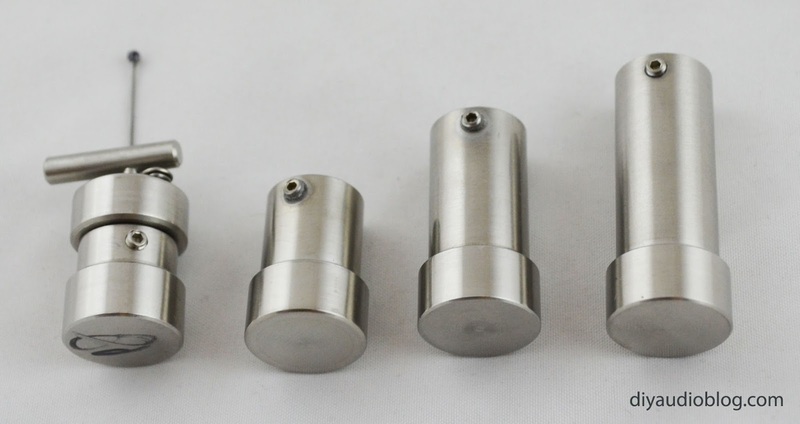 Magnequest (Transformers): Some of the best custom wound "E I" transformers for audio. Magnequest transformers are used in designs by Wavelength Audio, Curcio Audio, Alessandro, and other well-known makes. Check out the site for Bottlehead upgrade transformers as well. Mouser (General Supplier): Need to populate a PCB? Mouser likely has everything you need aside from tubes and traditional tube sockets. If they don't... try Digikey. Neurochrome (Tube and Solid State PCBs): The Modulus86 seems to be a popular design based around the LM3886 chipamp with some performance enhancements. Very low total harmonic distortion, if you're into that ;) Also a very cool 300B SET (single ended triode) PCB set is available. Oddwatt (Tube Kits): Oddwatt is a two person team (Bruce and Rodney) offering a number of tube amplifiers and a preamplifier with simple but effective circuitry. The kits include Edcor transformers and custom chassis and PCBs. I don't know too much about the company, but there is a nice write up on DIYAudioProjects. Pete Millett (Tube PCBs): Tons of great designs for tube amplifiers, pre-amplifiers, headphone amplifiers and the like. Some beginner friendly designs like the Butte and Jonokuchi headphone amps, as well as expensive, esoteric amplifiers designed around unusual tube compliments. Definitely worth checking out! Transcendant Sound (Tube Kits): I havent purchased a kit from Transcendant Sound (yet), but have heard many good things. From what I see they look to be a tremendous value. The Grounded Grid pre-amp is quite popular, and the OTL (output transformerless) tube amp designs are said to offer treble clarity rivaling solid state. Triode Electronics (Tube PCBs and Kits): Dynaco-based amp kits as well as some guitar amplifier kits. Very nice selection of parts and tubes as well if you are building a vintage amp. Directions not quite as perfect as Tubes4HiFi or Beezar, but still very good. Tube Audio Lab (Tube Amp Kits and PCBs): Great and not overly complex tube-based point-to-point kits and PCBs using the classic 300Bs, 45s, 2A3, etc. Parts selection based on your preferences. Tubes4HiFi / Bob Latino (Tube PCBs and Kits): Roy and Bob run a really great DIY amp and preamp site. There are models based on the Dynaco ST70 and MKIV, as well as some higher wattage versions if you have some pretty demanding speakers or a big room to fill with sound. Lots of great kits, excellent directions for most offerings (some of the pre-amps have more basic schematics, etc). Great products at reasonable prices from my experience. ChipAmp (Solid State PCBs and Kits): Allen at Chipamp has a fantastic array of chipamp / gainclone builds based on the LM1875, LM3886, and LM3875. He also has some great power supply, volume and switcher PCBs. Very simple and easy builds. Beginner friendly except the power amps use high amperage and would be dangerous if safety measures aren't followed carefully. UPDATE: per communications at DIYAudio.com and HeadFi.org, it seems there may be issues with order fulfillment in 2016-2017. Classic Valve (Tube and Solid State PCBs): Geek at Classic Valve is getting out of the PCB business to shift his attention to building turn-key amplifiers. I encourage you to buy up what he has left. There are a number of very unique Dynaco boards for the PAS, ST70, MKIII and MKIV as well as power filters and other great stuff. DIYTube (Tube PCBs): Shannon at DIYTube is getting out of the PCB business to shift his attention to building turn-key amplifiers. You will still find excellent documentation on DIYTube.com and a semi-active forum, however the boards are no longer available. Transcendar (Transformer Producer): Once an extremely high value "E I" transformer producer, this maker appears to no longer be producing new products. The Fine Print: DIYAudioBlog and Zynsonix Audio, LLC does not represent or have any business affiliation with any of the above businesses or individuals. Building/modifying circuits can be dangerous to you and/or your surroundings and should only be performed by a certified technician. The owner of this blog and all associated parties can not / will not be held responsible if you attempt a build or modification posted above and cause physical harm to yourself or your surroundings. Many electronics contain high voltages that can kill, and mods, if performed improperly, can be a fire hazard. Please keep this in mind.